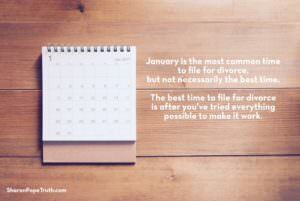 Five Reasons Why So Many People File for Divorce in January and When is the Best Time to Divorce? January may be the coldest month for both weather and marriages. It is notoriously the highest month for divorce filings – appropriately referred to as “Divorce Month” in legal circles. And historically, the first full week back to work – which is next week – will be the busiest week of Divorce Month for lawyers. Maybe if you’re facing this yourself, it provides you a bit of comfort knowing that you’re not alone. But just because it’s the month where the most divorces are filed, doesn’t lessen the blow of the process and all that’s ahead of you. Going through a divorce is easily one of the most painful and stressful experiences you can experience. The marriage was struggling before the holidays, potentially even for years before this last holiday season. Then, the holidays bring about increased tension and decreased communication between spouses as they just attempt to get through a busy and stressful time of year. If one person within the marriage has made-up their minds that divorce is the next logical step, they use that time over the holidays to do research and begin to get their legal and / or financial ducks in a row. If one or both of them hasn’t yet made the final decision to pursue divorce, they likely look to the nostalgia of the holidays to give the relationship one more try. If that doesn’t work, the decision gets made in January. Let’s be clear: No one wants to break-up their marriage during the holidays, particularly when there are young children in the family. So, most people wait until January to take the next steps. Lastly, and maybe most importantly, the new year brings about resolutions and renewed commitments for change in our lives. So, it makes sense that some couples simply don’t want to be in this same painful place at this time next year and now have the resolve to take action. None of this makes January the best time to divorce, just the most common time. The best time to divorce is after you know you’ve tried everything possible to make it work and feel good for both of you to no avail. It’s only after you know you’ve genuinely tried everything, that you can walk away without regret and not spend the next decade second-guessing yourself. The best time to divorce is when you have clarity. If your marriage is feeling as cold as a January snow storm, and you fear you’re headed for divorce if something doesn’t change, then now is the time to do everything possible to see if your marriage can be fixed, to see if you can find your way back to one another, or to know for sure that it’s time to lovingly release it.